ian Ambassador Andrey Karlov, murdered here in Turkey yesterday. Had I, I’m fairly certain, like many others, I would have disagreed with his views and especially his country’s actions in Syria, which likely caused his death. But none of this in any way justifies the killing. 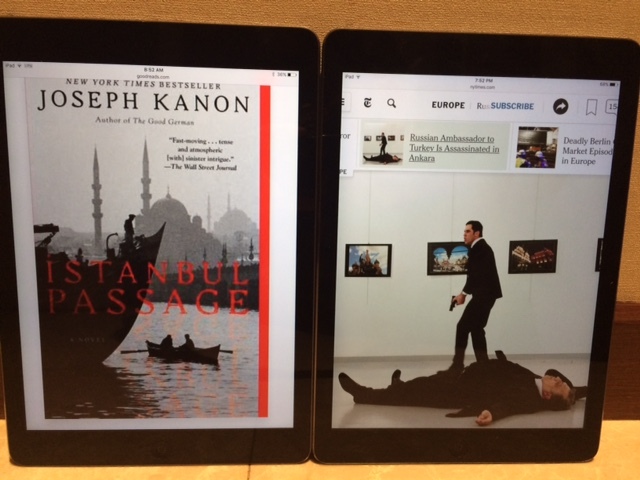 This incident, coupled with last week’s deadly bombing just down the road at Istanbul’s Besiktas stadium, has me thinking a lot about Joseph Kanon’s well-crafted thriller, “Istanbul Passage.” The action in this 2012 novel is sparked by the shooting death of a foreign diplomat on the banks of the Bosporus, not far from the same stadium. While Kanon’s intricate espionage tale takes place in the wake of World War II, the targeting of someone for what he symbolizes rather than for who he is holds an eerie similarity to yesterday’s assassination. As a diplomat living in Istanbul who recently published my own thriller, “A Simple Game,” which partially takes place in some of the same spots as Kanon’s, I was predisposed to like this novel. And what’s not to like? It has a fast-paced and believable plot, fully-drawn and original characters, and touches on some timeless topics that catapult it out of the 1940’s and onto today’s television screens. The title, in fact, refers to the routes taken by people fleeing from various hardships, the Holocaust survivors and former Nazis of that era mirroring the desperate voyages of Syrian refugees from our own. What I liked best about “Istanbul Passage” was how it drove home the notion that even in the immediate aftermath of history’s bloodiest conflict, we return right back to our primitive ways, failing to appreciate that violence only begets more violence – a theme I likewise explore in my novel. While art can open our minds to the possibility of peaceful new realities, the senseless murder of Ambassador Karlov and the death of 38 innocent people outside Besiktas stadium should serve as yet more real-life reminders that we, as people, still have a very long way to go.